Announcing Gathering and Games! This is the perfect opportunity to kick back, relax and have fun with other HOLers. Every month, we’ll be hosting an informal weekend get-together on IRC where we’ll play games and chat. The idea is for everyone to enjoy some time with other HOLers and get to know people they might not ordinarily have a chance to speak to. Professors, Students, Postgraduates, ghosts, Giant Squids: everyone is welcome! It doesn’t matter if you have experience with IRC or will be trying it out for the first time, come join us. For more information on how to access IRC, please visit the HOL Chatrooms section of the Handbook. Events will take place in the dedicated channel: #gamesroom. We’ll be doing our best to announce the dates here as early as possible. You can find explanations for our range of games via this link - we’ll keep adding to it and hope to keep the programme varied and exciting. The next event will be Sunday, April 28th between 5pm and 8pm HOL time). We’ll be aiming to play a different game every hour and we’d love to see you there, whenever you can make it. We understand this is kind of early for certain time-zones but we’re trying to compromise so it’s suitable for as many people in as many places as possible. Please note that everyone will be expected to conform to all HOL rules and in particular the IRC guidelines at all times. The channel will be moderated for the duration of the event, after that we ask that you move back to #hol to continue chatting. Last edited by Sky Alton on Fri Jan 11, 2019 3:13 pm, edited 2 times in total. This sounds so cool, I can't wait! Just under 24 hours to go. Hope to see you in #gamesroom between 5 and 8 PM HOL-time tomorrow! We had a brilliant turn out from all houses and an amazing event yesterday! We kicked things off with ‘Who Am I’, with Prof. Tarma Black’s Dedalus Diggle proving the most devious and Will Lestrange’s Lucius Malfoy the most dramatic. Shadow Gaunt was the best detective out of all of us, rumbling two people while putting in a very strong performance as Hermione. We moved onto a game of Cursebreakers after that, presided over by the fabulous Amy. The explorers successfully traversed the ruins for the first few rounds, avoiding groups of fierce bandits, answering sphinx’s riddles and fighting their way through purple mists to gather plenty of treasure. When the first artefact was discovered during round 3, it was a tense moment to see who would leave with it: Will or Prof. Zenix James. In the end, Will carried off the artefact and Zenix carried on the round alone, a move which massively paid off as she discovered a large amount of treasure which she got to keep to herself. Unfortunately, two fwoopers in quick succession put pay to round 4 and everyone had to beat a rapid retreat. They were brave enough to venture in one last time though and Zenix (thanks to what she terms her ‘typical Gryffindor recklessness’) emerged the winner, having collected 61 pieces of treasure to Will’s 39, Tarma and Shadow’s 20 and Kendra Givens’ 17. I'm not entirely sure I've ever seen that many people yelling 'gooooold' before. After that adventurous interlude, we rounded off the evening with Articulate. In a stunning collective performance, everyone who played scored at least 2 points. Will emerged the victor with 13 but the prize for answer of the night has to go to Shadow for guessing Filiu flitciwck and making my week with her avant garde typing. We’ll be meeting again next month on Sunday December 17th between 5 and 8 PM HOL! Hope to see you there. Quick reminder that we'll be in #gamesroom between 5 and 8 PM HOL-time tomorrow (the 17th)-hope to see you there! Most of the chaos resulted from THE MOST difficult rounds of 20 questions we’ve ever had. The game started out relatively calmly with a round from Prof. Tarma Black, won by Prof. Cody Lewis. After that, I’m not entirely sure what happened. Suffice to say, thanks to some tricky questioning by Amy, Cody had to resort to those stalwart options from TV’s Who Wants to be a Millionaire: 50 50, phone a friend and ‘Ask Sky’. After a lot more confusion, desperate guessing and a new QM, to everyone’s relief (not least Cody’s), Will Lestrange guessed “nosebleed nougat” and we could all collapse, exhausted. You’d never have thought that a dramatic game where we sniff out secret agents would have been relaxing but after that first one, Codenames seemed like a very good cool down. At the climax of a fun battle of wordy wits between the Purple and Orange teams, encompassing leprechauns, Star Wars and fragrant herbs, the Orange team emerged victorious. Due to the overrunning of the other two games, we didn’t have time for our scheduled game and decided to give 20 questions another chance. Shadow Gaunt stepped up to the plate this time with Gail Allen asking the questions. It became pretty obvious early on that Shadow was a formidable thinker: who else would answer in riddles? We had got to around question 15 and were no closer to working out ‘which’ plant-based thing Shadow was thinking of when she had to leave and hand off answering duties to me. I don’t think my sudden blank about the colour of the thing and subsequent backpedalling helped the confusion much! We’d reached question 20 and only one person had one guess left. In a truly spectacular move, Amy managed to light on the correct answer of "crystallised pineapple", wowing us all. We’ll be meeting again in just under a month in #gamesroom on the 21st of January, between 5 and 8 PM HOL-time! Come join us and chase the end-of-term-not-quite-next-term-yet blues away! Remember we're meeting today at 5 PM HOL in #gamesroom. Hope to see you there! Now that I’ve recovered my score sheet from a very mischievous fwooper, I can recap last Month’s gathering and Games. And bring you the joyous news that this month’s is on 25th February! January’s session was a wild ride as we were road testing two new games, as well as introducing everyone to a supercharged version of one we’d already seen before. Round 2 began equally well but then they encountered a sphynx and her riddle (what do cats, dogs, birds and turtles all have in common). While not everyone got the answer (the letter S) totally right, they all managed an approximation and the vegetarian sphynx let them by. They discovered a huge hoard of treasure and Will Lestrange decided to play tactically and take his share to safety. Aurelia West and Cody battled through a bat bogey hex only for Cody to decide to leave, with Aurelia carrying on alone. She too left after scooping up a few more gold pieces. We finished off the night with a quick round of 20 Questions in reverse. Everyone else in the room knew what item from the Harry Potter universe Cody was: it was up to him to ask questions in order to find out. After 19 questions and plenty of chaos, he lit upon the correct answer and declared himself a chocolate frog. Looking forward to seeing you for more hijinks on the 25th of February between 5 and 8 PM HOL time in #gamesroom! We'll be gathering in #gamesroom in around 24 hours: 5PM until 8PM on Sunday 25 Feb. Hope to see you there! Our next gathering in #gamesroom will be on Sunday the 18th of March between 5 and 8 PM HOL-time! February’s was a riot. We started off with the shiny new ‘Hogwarts Internship Program’ where everyone had to apply for a job…the catch being that they could only do so with a list of traits provided. Some were sensible, whereas others (Stylish, fluffy…) took a little more shoe-horning in. Vanessa Tilley was the first person to gain employment with the Committee for Experimental Charms due to her ‘Sky’s the limit’ thinking. Prof. Cody Lewis soon followed with a post as a Gobbledegook translator, secured by the ingenious use of a time turner. We debuted another new game next, ‘Word on Diagon Alley’. Before we even started Vanessa had christened it ‘Word Tug-o-War!’ which sums it up perfectly as the Orange team (Emma Borg, Shadow Gaunt, Prof. Tarma Black and Will Lestrange) and Purple team (Cody, Vanessa and Darcy Goode) competed to move letters across the game board and into their territories. This involved picking words in response to categories and we ended up with some sensational ones that I’m tempted to weave together into a surrealist poem. Say it with me… boysenberry, cappuccino, entertainment, skateboard, volleyball, development, topography, Isicathamiya (yes, really). With their response to the piratical category, the Orange team secured the needed number of letters and won the game. We rounded off the night with a few games of ’20 Questions: Through the Looking Glass’ (or Reverse 20qs if I’m feeling lazy). This game went down a storm last time and involves one person asking questions of the rest of the room in order to find out which HP character or object they are. Tarma began and put in a blisteringly fast performance, guessing that she was a Sneakoscope within 6 minutes (12 questions). Cody followed, identifying himself as Tonks within 10 questions (though not quite as fast as Tarma). Looking forward to seeing as many of you as possible for more frolics in #gamesroom at 5 PM HOL-time on the 18th! Our April Gathering in #gamesroom will be on Sunday the 29th, 5 PM until 8 PM HOL-time! March was a pretty relaxed affair where we played some fan favourites. We kicked things off with Spell It Out, where everyone is given a handful of spells and must pick one to get them out of a sticky situation. BJ Johnson was the victor in the first round, after realising that the way to rescue his Yule Ball outfit was a simple switching spell. Will Lestrange’s audacity saw him through a potentially catastrophic Transfiguration lesson as the homorphus charm allowed him to reveal that his difficulty was because the mouse he’d been presented with to turn into a snuff box was an animagus (much to Professor McGonagall’s chagrin). The final two rounds were won by Prof. Scarlet Leslie Lewis for a daring pillow fight with the whomping willow and Anna Snape for saving her entire house from detention with a sneaky hover charm. The image of broken furniture and items bobbing around on the Slytherin Common Room ceiling is one I won’t forget in a hurry. We moved onto Articulate next which was its usual shambolic self. Prize for best clue of the night goes to Scarlet with ‘Not Rare Red’. Once again, there was an item so obscure and hard to get exactly enough that we were guessing forever: this time, the fault lay with Aunt Petunia’s violet pudding. Will finished the game on 12 points, with Scarlet coming in second on 5; Prof. Cody Lewis and Prof. Tarma Black rounded out the standings with 4 points each. We finished off the night with ‘Who Am I’. Will excelled himself as Xenophilius Lovegood (so well, in fact, that Tarma rumbled him very quickly). Tarma was Ginny Weasley and when Will unmasked her, then was unmasked by her in turn as Slughorn, I decided it was best to get her to nominate someone else least we get stuck in a time loop. Scarlet put in a strong turn as Madame Pomphrey but was then upstaged somewhat by Cody’s hilariously irascible Uncle Vernon. History then repeated itself as Katelin Ross sussed him, then he sussed her as Rita Skeeter in the final round of the night. Remember we'll be in #gamesroom from 5 PM HOL-time tomorrow! See you there. April’s session saw the debut of two new games. First was a test of social deduction with Spyfall. Here, all players were given a card with the group’s location and a role for them to play. Well, all except the spy who was left to guess our location from what we said. The chase was on to see if we could uncover the spy’s identity before they worked out where we were. The first location was a Spaceship and the questioning began. Prof. Tarma Black suspected it was Emma Borg after she revealed there was no nice view where she was, though the group didn't unanimously agree so the round continued. We got to the accusation stage where there was an unbreakable deadlock between those who thought I was the spy myself (due to my revealing that I'd paid to be in the location while everyone else was an employee) and those who still thought it was Emma. Eventually, Emma revealed herself but couldn't correctly guess our location so we called it a tie (and I was able to exonerate myself with the revelation that my card said 'Space Tourist'). 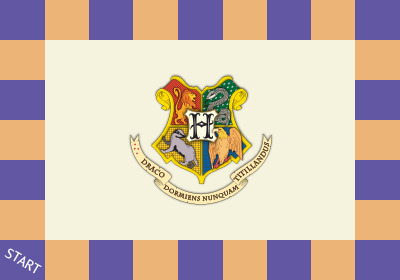 Next we relaxed with a couple of rounds of Hogwarts internship Programe, the game where we have to apply for a job using a list of very random items and abilities of questionable use. People offered very convincing reasons from being able to speak many languages to being intimately familiar with wizarding biscuits but it was Emma's passion for herbology (and rearing of a young Flitterbloom) that secured her the first job as a Potioneer. There were then some equally compelling applications for the position of Daily Prophet editor but in the end my promise to provide the Newsroom with therapy Pygmy-puffs won out (though secretly I believe it was really down to my very, very fancy hat). For the finale, we gathered round for a story as ‘Once Upon a Time’ made its first appearance. The aim of this game is to create a story that includes all your character, event and item cards and that fits your assigned ‘Happy Ever After’. Simple right? Well, not so much when everyone else can interrupt you for various reasons and take over storytelling to steer it towards their own ‘ever after’. Tarma, BJ Johnson and I told an exciting (if convoluted) tale about a race, some frogs and the chance to be king for a year. Eventually, a spell lead to the crowning of that year's worthy candidate and the ‘Ever After’ card brought things to a suitably happy conclusion. Looking forward to seeing as many of you as possible on the 27th! Join us for mayhem and magic in #gamesroom tomorrow from 5 PM HOL! In May, we began with a few rounds of ‘Where Am I’ where one player answers questions from the rest, trying to guess their fictional location. After the full 20 questions, Amy guessed that Prof. Tarma Black was lurking outside my dorm on the amazing slide-becoming staircase to the Gryffindor girl’s dormitories. After 9 questions, Marcie Hobber guessed that Amy herself had jetted off for some continental sunshine at the palace of Beauxbatons. Next we played a favourite, Articulate. It was a strong showing with answers ranging from sweets to magical authors (though Beedle the Bard really gave folks the run around). We ended with Will Lestrange on 8 points, Marcie on 4 points and Tarma on 3. With Articulate being such a quick fire round, we had time for a spot of ‘Who Am I’. Will put in a very flamboyant performance as the wizarding world’s leading reporter, Rita Skeeter, but Tarma’s insistent questions about his outfit soon revealed his identity. Tarma was equally as convincing as Dobby the elf, though it was her feelings about Harry Potter that gave her away and Will unmasked her. In the final round, Will turned on the unctuousness to portray Professor Karkaroff and Marcie sussed him after he expressed his opinion about the comparative merits (or lack thereof) of Hogwarts. As our last game, we decided to try out Spyfall again. In the first round, the players sussed out Will who thought they were at a corporate party, rather than a supermarket. However, Amy slipped past them in the theatre as Will came under suspicion again, this time for being less than complimentary about the play Marcie was directing. In the final round of the night when several new players joined us, Tarma evaded suspicion and even managed the ultimate coup of guessing the location of a restaurant. Hope you’ll come celebrate the end of term and freedom from classes with us on the 24th! We'll be seeing this term off in style in #gamesroom, 5-8 PM HOL-time tomorrow. Hope to see you there! Next up it was another outing for ‘Once Upon a Time’, the story telling game. Curtesy of Amy, Prof. Tarma Black, Prof. Cosmo B. Mott and Will we had 2 wonderful yarns that I’d love to find in my book of fairy tales: one about ethical princesses avenging persecuted monsters (won by Tarma) and a baker coming to the aid of her town to deal with a gremlin who turned out just to be hangry (won by Will). We finished off the evening with a healthy bout of social deduction. First up was a fixture of the last few games: Spyfall. This time the crew couldn’t suss out the spy at the zoo and Tarma walked free (though she missed out on guessing the location so it was counted as a draw). After that, there was a little time for a game of Who Am I with Tarma once again taking centre stage, this time as former Minister for Magic, Cornelius Fudge. We’re taking a break over the summer as Amy and I have to go out with our nets and see if we can snag a fresh crop of games for next term. We look forward to welcoming you back to the #gamesroom then so keep an eye on this post for details when they emerge. Due to an unexpected sighting of the Crumple-Horned Snorcack, which we need to investigate further, we'll be rescheduling Gathering and Games to October. We'll announce a new date closer to the time. Glad to announce the return of G and G on Sunday 28th October, between 5 and 8 PM HOL-time! Hope as many of you as possible will drag yourself away from those magical textbooks and join us as we kick back, relax and have some well-deserved fun.